I drove into Washington at 5:30 a.m. and drove to the Visitors center, parking on the street nearby. 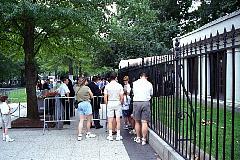 I waited in line for about an hour and then at 7:00 a.m. the line for same-day tickets for the White House tour began to move. There were only 9 tours given at 15 minute intervals between 10:00 am and noon. I got tickets for tour #7: plenty of folks left without them. The moral is get there early. After getting tickets I returned to the hotel for my family. Here is where the tour of the White House begins. Your congressman may be able to get you advance tickets if you give them plenty of warning. One walks up the driveway and enters the ? and goes through security. At the head of the line looking back. You can only get four tickets - they stamp your hand with ultraviolet dye and one person in every group must have that stamp. Everyone has to have a ticket - even children. You can't take pictures in the White House. I was talking to one of the guides/security people in one of the "colored" rooms when he quickly excused himself and went after a guy taking pictures. "I told you once, you won't listen to me, will you?" he told the guy. The picture taker's tour was immediately terminated and he was escorted out. I asked a policeman outside about the film and he said most likely it would be "accidently" exposed as the man was escorted out. 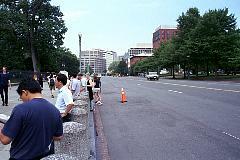 Pennsylvania Avenue is closed to automobile traffic for security. The White House is around the corner to the left. Straight down to the left is the southeast corner of Lafayette Park, which is across from the White House. This statue is a memorial to Marquis de Lafayette, a major-general in George Washington's Revolutionary War Army. 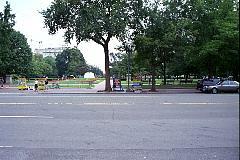 View along Pennsylvania avenue with the White House to the left. 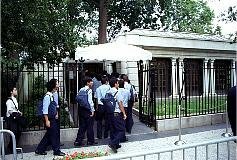 The near gate is the pedestrian gate, the second gate is for automobiles. Way down,very hard to see, is another gate for autos. 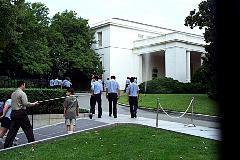 The front of the White House. 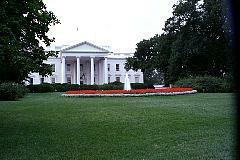 The White House was only adopted as the site's official name during the Theodore Roosevelt administration. The President's House, as it was first called, was the first official building of Washington, constructed before the Capitol or any of the monuments. 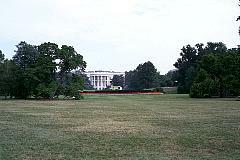 George Washington chose the site for the President's House. He loved the view offered by the downhill swoop to the Potomac. Despite having chosen its location, George Washington never got the chance to sleep, much less live, at the White House. But all other presidents since John Adams have lived at the White House. A competition was held to find the design for the executive mansion. One of the entries received was a simple Roman design submitted by none other than Thomas Jefferson. Perhaps had Jefferson signed his own name rather than with pseudonym to his entry, his design might have won the competition. Instead, the man who won, and received the $500 prize money, was James Hoban, a little-known, self-taught craftsman from Ireland. His winning design was based on a classical Irish manor near Dublin. 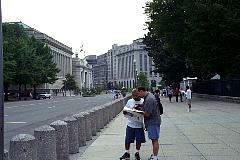 Looking east down Pennsylvania avenue, you see the Treasury building to the right. 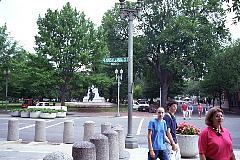 Originally called the President's Park, Lafayette Park earned its name in 1824 when Revolutionary War hero Marquis de Lafayette made a visit there. During his say, the city welcomed Lafayette with numerous dinners and receptions. The park where the festivities took place was re-named in his honor. 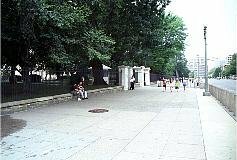 For some time, though, the park was also called Jackson Park, for the statue of Andrew Jackson that long dominated the area. Installed to honor Jackson's role at the Battle of New Orleans during the War of 1812, it was the first equestrian statue erected in America. The four cannons at the base of the statue were captured by Jackson from the Spanish. 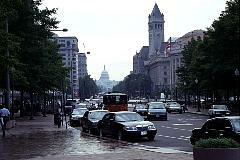 Looking down Pennsylvania avenue to the west.